The Serengeti is a large area in Africa, located mostly in Tanzania but also stretches across parts of Kenya. It covers almost 30,000 square kilometres! Much of the Serengeti is protected to preserve the habitat of the local wildlife. The Serengeti is said to be one of the most beautiful places in the world and one of the finest places to see lions in the wild! In addition to lions, the Serengeti is home to giraffes, zebras, warthogs, gazelles, leopards, hyenas and wildebeest. Every year, the great wildebeest migration sees almost 2 million wildebeest migrating around the Serengeti from the National Park in Tanzania to the reserve in Kenya. It’s said to be one of the wonders of the natural world and a must-see if you’re a safari fan! Of course, most of us can only dream of being able to see sights such as these in our lifetime. However, for us, Novomatic have made a slot game called Serengeti Heat. You can play this game and dream of the Serengeti, and try to win as much money as possible so you can go and see the real thing! You can see the grasslands, a lonely giraffe and a large lion in this slot’s backdrop. It’s very similar to other Novomatic games but they heat things up in Serengeti Heat. 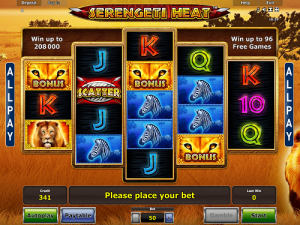 Instead of having traditional paylines, Serengeti Heat is an allplay slot. That means any consecutive combination of matching symbols wins! The slot pays from both sides, too! It’s hot in the Serengeti! In fact, the yearly average temperature is 28 degrees Celsius! This slot is even hotter because it’s an allplay slot. That means there are no paylines because every line is a payline! There are five reels in total but not all of them have the same number of positions. The reels are shaped in a diamond. The outer reels (reels 1 and 5) have 3 positions, the next reels (2 and 4) have 4 positions and the middle reel (reel 3) has 5 positions. The game pays both ways, so from the right to left as well as from the left to the right. This is quite unusual for a slot game, especially a Novomatic one! Only a few of their slot games pay both ways. Also, because there are no paylines, all you have to do is spin 3 or more of the same symbol on consecutive reels (any position on those reels) from reel 1 towards the right or from reel 5 towards the left. The symbols include: 10, Jack, Queen, King, Ace, a zebra, a giraffe and a lion. You can click on the menu to open the paytable and view the payouts for each symbol. They’re all worth different amounts (the lion is the most valuable) and these payout values will change according to your bet. In the Serengeti, there are some very special animals. For example, the dik-dik. This is a very small species of antelope which weighs only up to 6kg! In Serengeti Heat, on the other hand, there are some extra special symbols which can help you get win and can help you win Free Games! Firstly, the Scatter symbol, which is a Masai shield with spears, will pay from 3 or more matches but they don’t have to be consecutive. The Masai are the traditional warrior tribes who call the Serengeti home. There’s a Bonus symbol which is a zoomed-in picture of a lion’s eyes. This symbol is the one that can help you get Free Games! Any 5 Bonus symbols that land consecutively from left to right will trigger the Free Games! You will get 8 initially but every additional 5 Bonus symbols (falling consecutively) during the Free Games will award another 8 Free Games! The Wild symbol is present during the normal game and the Free Games. This is a lonely tree standing underneath a sunset Serengeti sky. The sunset is so stunning, the whole sky has turned red and orange! This Wild symbol can fill in for any symbol apart from the Bonus symbol and the Scatter symbol. That means it can help you get wins for ordinary symbols but it can’t help you win the Free Games.